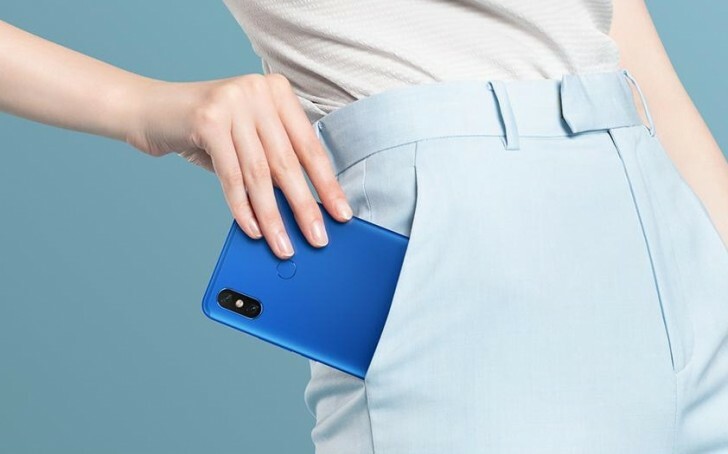 Xiaomi Mi Max 3 which has been leaking from few days has been officially unveiled. 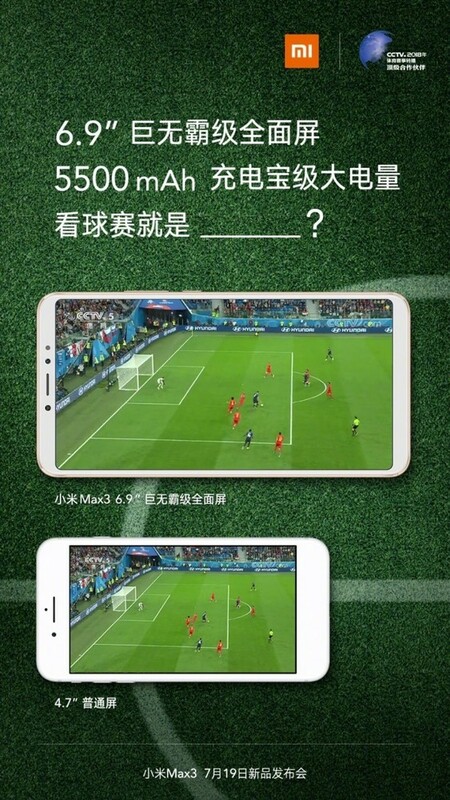 The smartphone was spotted on Weibo and later few press renders by Lin Bin bought a hype to the device. As mentioned in earlier leaks, the Mi Max 3 came with a huge 6.9-inch FHD+ screen with 18:9 aspect ratio and 5500 mAh battery. Many of the specs are similar to that of the companies Redmi Note 5 as it runs on Qualcomm Snapdragon 636 SoC with eight cores at a clocking speed of 1.8GHz. The handset sports a 12MP main camera with f/1.9 aperture size and has dual pixel phase detection AF along with a secondary 5MP sensor. There is also an 8MP camera on the front for selfies. The connectivity options include Dual VoLTE, Wi-Fi 802.11ac, Bluetooth v5.0 and a USB-C port. Out of the box the device will come with Android 8.1 Operating system and will have MIUI 9.5 on top. There are many other features like scene recognition, AI features, Face unlock, and a few more. There is a fingerprint sensor on the rear and the device will be available on Champagne Gold, Blue, and Black color variants. 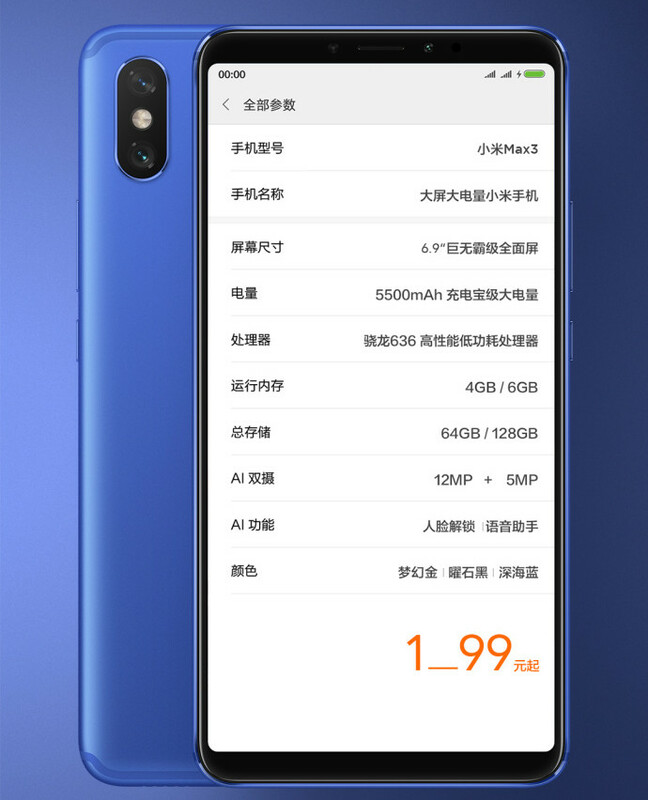 Moreover, the handset will be available on 4GB + 64GB storage option as well as 6GB + 128GB which are priced at CNY 1,699 (approx $252) and CNY1,999 (approx $300) respectively. Are you planning to get this device? Comment in the section below and stay tuned to Android Advices for more. Earlier: Xiaomi Mi Max is going to be announced tomorrow and we can still see many leaks coming out. 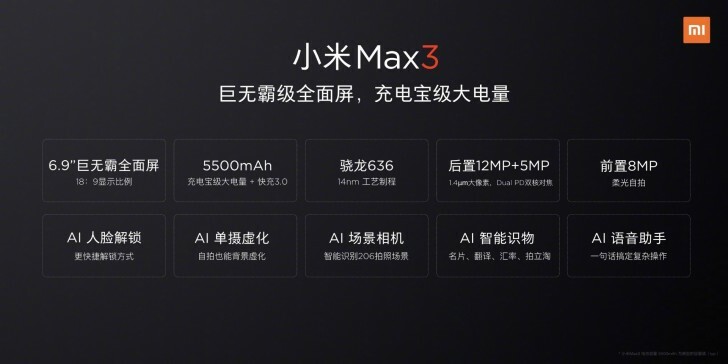 Lin Bin has leaked complete specs list of this upcoming smartphone today after he posted official renders yesterday. The pricing of the handset is also hinted and has been listed as CNY 1_99 which makes sure it is priced under CNY 1999. The Mi Max 3 will come with a 6.9-inch display as mentioned earlier and this LCD panel will also have protection on top. Under the hood, there will be a Snapdragon 636 SoC with a clocking speed of 1.8GHz and the device will be available in Blue, Black, and Gold color variants. Xiaomi also revealed that AI features for the camera which can detect 206 scenes along with AI face unlock, AI voice assistant and much more. The device will run on MIUI based Android 8.1 Oreo operating system out of the box and has a fingerprint sensor. On the rear, we can find a 5500mAh battery that supports Quick Charge v3.0. coming to camera section, there will be a 12MP rear-facing camera with Sony IMX363 sensor andLED flash along with 5MP secondary rear camera. 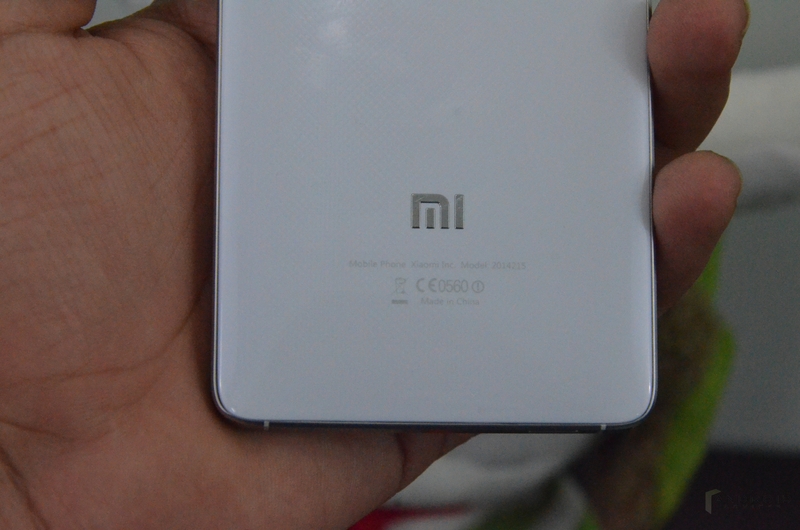 There is also an 8MP camera on the front with LED flash. We should wait few more hours to get the official print of this handset and also see if any other variant is also available. Stay tuned to Android Advices for more. Earlier: Xiaomi Mi Max 3 which was leaked last week, showcasing its sides and stickers has now teased with a few more specs like its big screen and a massive battery. Moreover, these leaks were on Chinese media which confirms all the specs. There is nothing known about the pricing and availability yet but within a few days, we are going to see it going official on 19th July. From the leaks we can say that the handset is going to come with 6.9” Display with FHD+ resolution and 18:9 aspect ratio and on the back, it will be powered with 5,500 mAh battery which 200mAh bigger than its predecessor. Few other leaks suggest that the device will be carrying a Snapdragon 636 SoC with eight Kryo 260 cores and a clocking speed of 1.8 GHz. The image also shows us a 4GB RAM variant with 64GB of storage. The Mi Max 3 will come with MIUI v9.6, based on Android Oreo 8.1 and will also be made available in multiple storage options. The smartphone will come with a dual camera setup of 12MP + 5MP and will be having 1.4µm pixel size. Well, we need to wait a couple more days, to know all the specs sheet of the device when the company unveils it officially. Are you going to get this device? Comment in the section below and stay tuned to Android Advices for more. Earlier: Another leak of the Xiaomi Mi Max 3 comes on air as the first video render leaks. A video of 0.3 seconds reveals sides of the smartphone and also shows the stickers. On the back, the handset has a fingerprint sensor as well as the dual camera setup which is expected to be 12MP + 5MP setup which will be powered with a 5,500mAh battery and has a 6.9-inch display. Earlier: Many are fans of the Mi Max series of Phablets from Xiaomi, and as the time is approaching for the release date of the Xiaomi Mi Max 3 which will be the successor of the Mi Max 2 that was released last year, we got new leaks. We have seen CEO’s teaser this week which makes the existence of the device legit. 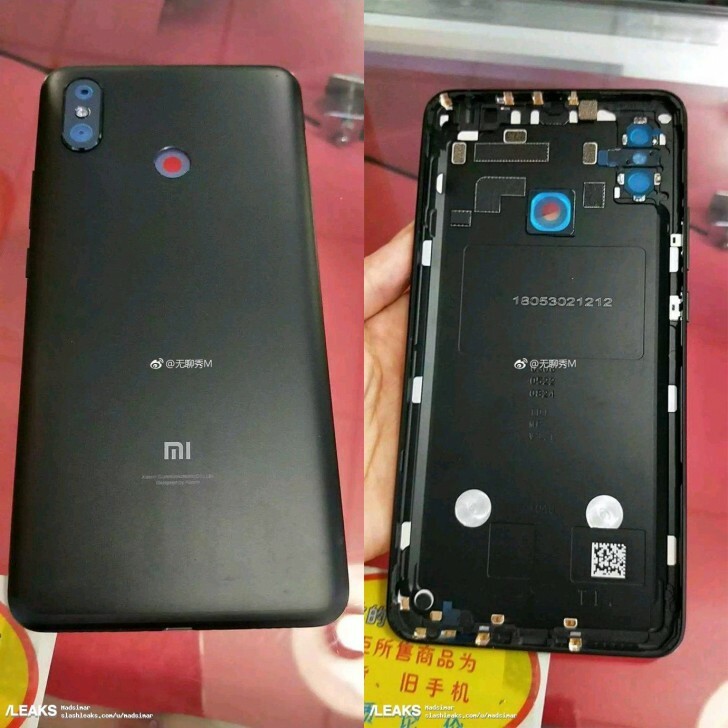 The newest leaks reveal the back panel of the upcoming phablet in the form of Live Photos and we can see a rear-mounted fingerprint sensor as well as the dual camera sensors as rumored earlier.